Congratulations on your upcoming wedding! 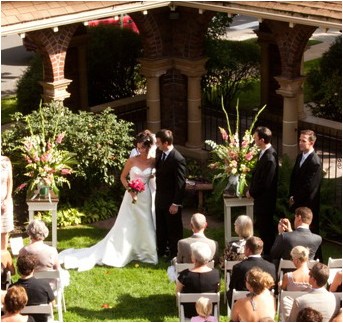 We are delighted that you are considering Washington Park United Methodist Church for your special day. We are dedicated to helping you bring your wedding day dreams to fruition. We are here to assist you with many of your ceremony details. Our church wedding coordinator will help guide you through each part of your wedding, and will take care of you and your guests. The most important part of the ceremony is the life commitment that you make to one another. Because we are committed to your marriage, as well as your ceremony, if you choose to be married by one of our pastors, we require two pre-marital counseling sessions. These help prepare you for marriage and allow you to become better acquainted with the pastor, making the ceremony more personal. We would be honored to share this exciting and blessed occasion with you! Our church was founded in 1893 and the current facility was built in 1918. We welcome tradition as well as change. 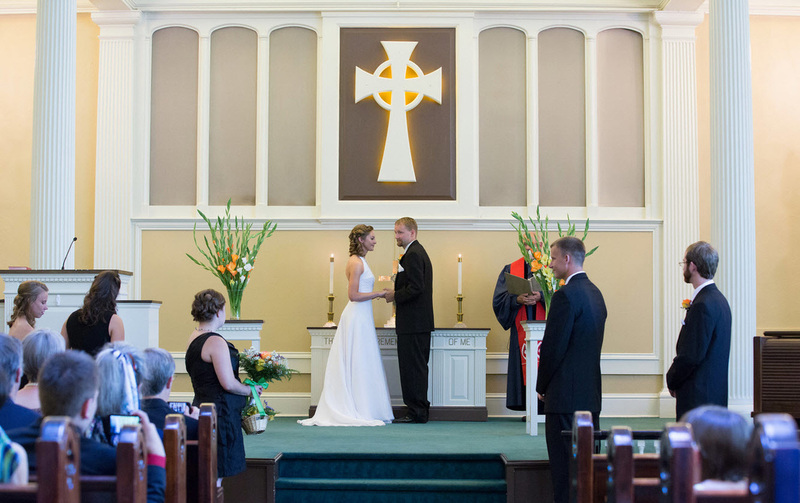 Because of the rich history in this community, as well as the architectural beauty of the church and intimacy of the sanctuary, WPUMC hosts numerous weddings and baptisms throughout the year. It is not necessary to be a member of WPUMC to use our facility for your wedding; however, we do ask your respect and consideration of our building and traditions. In addition, couples do need to respect our beliefs and activities regarding marriage. Marriage is a sacred covenant and should be entered into with serious consideration of the personal, psychological, spiritual and social backgrounds of the two persons involved. Visiting clergy are welcome to conduct and participate in wedding ceremonies in our facility after meeting with the minister in charge to clarify responsibilities. The sanctuary seats approximately 300 people, including the two balconies and the jury box. For smaller ceremonies, the courtyard fits approximately 100 people, including the surrounding pathways under the arches. Dressing rooms are available. Florists may bring flowers and decorations into the church two hours prior to the ceremony. All flowers and decorations must be removed after the ceremony. Note that the carpet and pew pads in the sanctuary are navy blue. Photographs and videotaping are permitted before and after the ceremony. A stationary photographer or video camera is permitted, but NO flash or roving photographers are allowed during the ceremony. NO SMOKING or ALCOHOLIC BEVERAGES are allowed anywhere on church property, including the parking lot. If such activity is observed, the individual(s) will be asked to leave. If such activity is discovered after the wedding, the church will retain your damage deposit. Throwing rice is fatal to birds and is NOT allowed, nor is birdseed, as it is dangerous underfoot. We encourage the use of bubbles or flower petals. Please remind your wedding party when in the church, it is a sacred place and should be respected as such. Tours are available by appointment. Please contact our church wedding coordinator or the office at 303-777-3043 or office@washparkumc.org. If the wedding participants decide that they want to go to a different venue after they have put down the deposit, do they receive their deposit back? The participants have one week (7 days) from the day they put their deposit down to change their venue from WPUMC in order to receive their deposit back. After this period, they will forfeit their deposit. This is a total of $200.00 ($100.00 down deposit and $100.00 damage deposit). Can the participants bring in their own pastor to perform their ceremony? Yes. However, our pastor Rev. Sandi Dillon will be attending the wedding ceremony in order to make sure things run smoothly and in accordance with our church. Due to this, the fee cannot be reduced if any pastor is brought in. We also need the name and contact of the officiating pastor. Is the rehearsal an extra price? No, the fee includes one hour for rehearsal. Are there any restrictions on the dress code? There are no restrictions. Brides may wear strapless dresses, spaghetti straps, knee length, etc. The dress code must be tasteful and respectful. Can the participants provide their own musician as opposed to using WPUMC’s, which is included in the fee? Yes. The fee may be decreased by $100 for using your own musicians. Our piano, organ and sound system will still be available for their use. Can the participants provide their own music for the ceremony? Absolutely! We provide our sound system for use, and the participants can bring music or a slide show to be played. It must, however, be TV/DVD compatible (DVD-audio). The selection must also be respectful of our church. Where can the participants and their wedding parties get ready before the ceremony? The North Parlor, Library, and Youth Room are perfect locations to dress for the wedding. Parking? There is limited parking available at the church. Guests may park in the parking lot or on the streets around the church. Be aware that other activities in the church may decrease this space. Also, there are city ordinances around the streets surrounding the church; be aware of any permit parking. Does WPUMC provide chairs, tables, linens or silverware/glassware? WPUMC provides any chairs and tables necessary for either the ceremony or rehearsal. We have approximately 10 rectangular tables and 12 round tables. We do not provide linens or silverware and glassware. The participants may bring in their own if they would like. There is no fee for either.